Every year, Philly’s Joel Spivak gifts City residents and visitors with a month’s worth of events and displays to honor Philly’s role in wiener history. Details about these special events can be found on the National Hot Dog Month in Philly website. • 2:30 p.m., Sunday, July 5, Hot Dog History & Doll Display opens at 703 South 4th Street. Display on exhibit the entire month of July. • 6-8 p.m., Friday, July 10. Remembering Famous Hot Dog Stands From the Past, meet at the corner of 40th & Lancaster Avenue, in front of Texas Wiener for a memorial display and FREE hot dogs! • Noon, July 11. Third Annual South Street Hot Dog Crawl. Sample special creations at five restaurants celebrating National Hot Dog Month. The pay-as-you-go crawl, with street serenade by The Wild Bohemians, begins at Copabanana/Redwood Restaurants, 4th & South Street. Free 2015 Hot Dog Month Philly T-shirt to all who complete the crawl! • Tuesday, July 14 or 21. Visit the Levis’ Hot Dogs stand in Jenkintown, PA with a group of old timers that ate at the South Philly Levis many years ago. Their tales will be collected on video for a future film. • Saturday, July 18. South Street Headhouse District’s Dog Days of Summer Cook-off celebrates its fourth year. • 1-7 p.m., Thursday, July 23. It’s National Hot Dog Day! 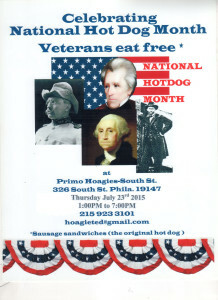 Join the folks at Primo Hoagies, 326 South Street, for its Annual Veterans Eat Free Sausage Sandwiches Day. • 1-3 p.m., Saturday, July 25. Remembering Famous Hot Dog Stands From the Past, at 5121 Germantown Avenue, for free hot dogs and a memorial tribute to The Little Dog House once located there. Franks for the Memories. Dozens of shops in Philly sell hot dogs, wieners, or franks of every size and description. But nostalgia runs deep in historic Philly for the old-time shops. The Original Levis Hot Dog and Sandwich Shop at 611 S. 6th Street. Perhaps the best known is Old Original Levis Hot Dog and Sandwich Shop. Fourteen-year-old Abe Levis left Lithuania to evade being drafted into the Czar’s army. In Philadelphia he married Anna Solo and together they started a hotdog push cart business. 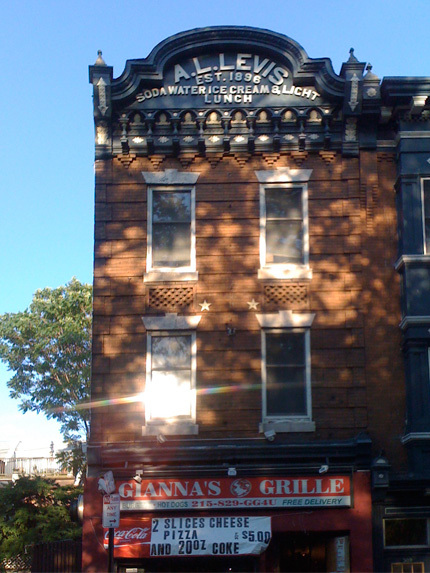 By 1895 they opened a little sandwich shop on South 6th Street, in the heart of the South Street business district, thriving with immigrant-owned businesses. The shop sold hot dogs, sandwiches, fish cakes, ice cream and sodas. 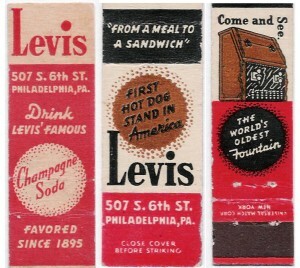 Levis even produced its own carbonation in the basement and became as famous for its cherry soda as it did for hot dogs. 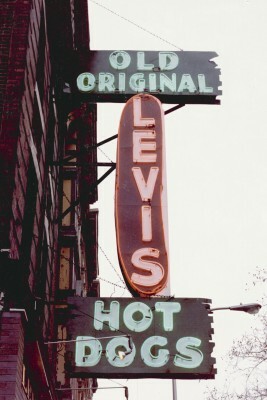 The shop lasted some 100 years at this location before heirs sold the business to Elliott Hirsh, who now owns rights to the brand and the formula for Levis’s signature soda, Champ Cherry®. Although the iconic place no longer exists, its sign does. Photo from PhillyMag.com. The large neon sign was restored by the Davidson Neon Museum and moved across town to sit atop the North Star Bar at the corner of 27th and Poplar Streets. The sign has since been removed and stored away, say its current owners. Tracy Kaufman Wood writes about her grandmother, Ida Kravitz, and provides a recipe for Pepper Hash on her blog, Who Can Stop A Dream. Bubbe Ida passed on her recipe from the old country to her son, whose business, Lenny’s Hot Dogs, has achieved its own local fame, says Tracy. Mom’s Pepper Hash is simple enough to make and Tracy includes the recipe on her blog. But be sure to “sh’terein” lots of love into the pot as well if you whip up a batch. For those anticipating Hot Dog Day with great relish, the City’s tourism bureau published a long list of Philly hot spots for hotdogs. Go out and get some! This entry was posted in Events and tagged Davidson Neon Museum, Famous Hot Dog Stands, Ida Kravitz, Lenny's Hot Dogs, National Hot Dog Month, O'Neal's Pub, Old Original Levis Hot Dog and Sandwich Shop, Philly's Joel Spivak, Primo's Hoagies, Third Annual South Street Hog Dog Crawl, Wild Bohemians. Bookmark the permalink.